A team of physicists at the University of Sussex have used a single pixel camera and Terahertz electromagnetic waves to devise a blueprint capable of leading to the development of airport scanners that can detect explosives. Miss Luana Olivieri, PhD student and Dr Juan Sebastian Totero Gongora, a Research Fellow in Experimental Photonics of the Emergent Photonics Lab directed by Professor Marco Peccianti and Dr Alessia Pasquazi, have discovered an innovative method of capturing with high accuracy, not just an object’s shape, but also its chemical composition with the help of a special "single point" camera that can operate at Terahertz (THz) frequencies. Even though their work is theoretical to a great extent at this stage - they discovered a unique imaging concept called Nonlinear Ghost Imaging - their potential to capture a more comprehensive image to earlier studies has landed them a prominent front-page feature of the scientific journal, ACS Photonics. Our approach produces a new type of image which is quite different from what you would get from a standard single-pixel camera as it provides much more information on the object. Compared to prior single pixel images, we also demonstrated that our resolution is inherently higher. Terahertz radiation, lying between microwaves and infrared in the electromagnetic spectrum, has a much greater wavelength to visible light. It can effortlessly penetrate a number of common materials like clothes, plastics, and paper heading towards the development of technology within security scanning and manufacture control which permits people to see inside objects and wrapping. The radiation incites a different response from biological samples though, permitting researchers to categorize materials which are practically indistinguishable with visible light. Scientists are of the belief that THz waves could have a huge potential in developing critical applications such as medical diagnostics, explosives detection, food safety, and quality control in manufacturing. However, the challenge lies in the development of cost-effective and reliable cameras as well as the potential to detect objects smaller than the wavelength. But, the team of the Emergent Photonics Lab may have discovered a way to overcome these limitations by employing a different approach to earlier studies in this field. While earlier research has illuminated objects with several patterns of laser light in just a single color to extract an image, the researchers were able to illuminate an object with patterns of THz light containing a broad spectrum of colors. A single pixel camera (instead of a standard one comprising of multiple pixels as sold on the high street) is capable of capturing the light reflected by the object for each pattern. In the team's research, they discovered that the camera is capable of detecting how the pulse of light is modified in time by the object (even if the THz pulse is a very short event). Incorporating this information with the known shape of the patterns has resulted in revealing the shape of the object and its nature. It could be possible for the technique to recall the way the brain develops understanding in the vision by separately focusing on varied elements and then merging the applicable information. 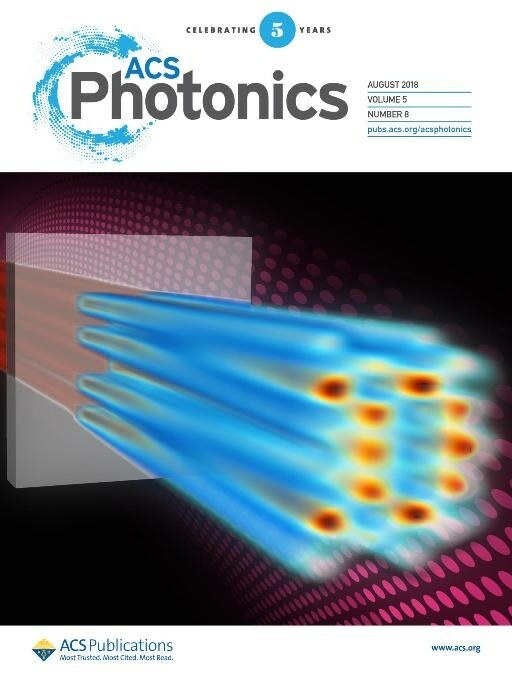 This is a really significant development and we're really happy that ACS Photonics decided to lead with our research on their front cover. Previous approaches to THz single-pixel cameras cannot preserve the complete information on an object but we understood where the issue lay and identified a way to extract a more complete image. We hope that a similar system to ours could be used in real-life applications in biology, medicine, and security to determine the chemical composition of an object and its spatial distribution in just one step. The team's findings are considered to be a huge improvement on established technologies and could also have a major impact beyond the field of THz cameras. For example, their technique could be employed for designing high-resolution cameras in other frequency ranges which could then become part of the technology for body scanners, collision sensors or ultra-rapid radars for self-driving cars. The researchers are presently following up on their research, which is chiefly based on simulations, in order to experimentally demonstrate their device.